ABSTRACT: In August 1966, when the author was working as a “Motorman” (a train driver) for London Underground, one of his train crew colleagues, a train guard named George Balaam, retired after 50 years service. He told the author he had started as “a boy” at the age of 15 years in August 1916. Although he didn’t make it clear at the time of the conversation, he would have been a junior porter, signal box boy or messenger at that age. After three years, he became a “gateman” on the Piccadilly Line and remained as train crew for the rest of his employment. During that 50 years, there was much change but there was also much that remained unchanged. This paper looks at the 50 years of George’s employment and describes both the constants and the changes that took place technologically and socially on the London Underground during that period. Piers Connor is a senior international railway professional with extensive management expertise and front line experience in rail project development, planning, design, maintenance, operations and manufacturing in Europe, Middle East, USA, South Africa and Asia. He has a wide ranging recent consultancy portfolio in the UK and overseas. Experience of projects for both existing and new railway systems around the world including London, US, Hong Kong, Singapore, Bangkok and Taiwan. Publications include several books and articles about rolling stock history and railway delevopment and he is visiting lecturer in a number of universities in the UK. Piers worked for London Underground for 25 years and has studied and researched its history over many years. He obtained his MSc in Railway Systems Engineering at the University of Sheffield, and has professional membership of Chartered Institute of Logistics and Transport, member of Institute of Railway Operators and is lead tutor for Engineering module in Institute of Railway Operators degree course. Now employed as part time senior lecturer at the University of Birmingham and studying part time for a PhD. Just a quick reminder of tonight’s live stream: From computers and history to digital history: a retrospective. To join us simply go to the History SPOT site at 5.15pm and open up the pop-out video, chat, twitter, and slide show. The next Digital History seminar will take place in the Bedford Room (G37, Ground floor, Senate House) and will also be live streamed at 5.15pm (BST) on 28 May 2013. See below for details of how to join in. Historians were among the first humanities scholars to utilize computers as research tools, recognizing their value as early as the mid-1960s. Since that time, as the technology and the field have both evolved, computers have remained important tools for research, teaching and communication. With an ever greater breadth of scholarly activities for which computational tools are used, the Digital History Seminar has convened a panel the reflect on the ongoing dialogue between information technologies and their use in the discipline of history. The panel will be made up of pioneers in historical computing including Sir Roderick Floud (Gresham College), Robert Shoemaker (Sheffield) and Don Spaeth (Glasgow) who will discuss the past, present and future of digital history. Each of the panelists has played a significant role in the development of the use of computational methods for historical phenomena. They will collectively provide a fascinating picture of the shift from historical computing to digital history. Each panelist will speak for about 15 minutes on their use of computers and digital tools for historical research and teaching. The talks will be followed by a moderated discussion. Sir Roderick Floud is a distinguished professor of economic history and has been Provost of Gresham College since 2008. Previously he was Dean of the School of Advanced Study of which the IHR is a part, Provost of London Guildhall University and the first Vice-Chancellor of London Metropolitan University. Among many honors and fellowships he is a fellow of the Royal Historical Society, the Royal Society of Arts and the British Academy. He has published widely on topics as diverse as technological change, the use of IT in the study of history, the evolution of technical education and changes in human height, health and welfare. He was knighted in 2005. Robert Shoemaker is Professor of Eighteenth-Century British history at the University of Sheffield. He has published on the history of crime and criminal justice, gender, and violence. Along with Tim Hitchcock and Clive Emsley he is director of the Old Bailey Proceedings Online, a fully searchable edition of the entire run of published accounts of trials which took place at the Old Bailey from 1674 to 1913. This groundbreaking work was the first of a number of important primary source resources that Shoemaker and Hitchcock have created. In January 2011 he and Hitchcock were awarded the Longman-History Today Trustees Award, presented to a person, persons or organisation that has made a major contribution to history, for their work on the Old Bailey and London Lives projects. Don Spaeth is Senior Lecturer in History at the University of Glasgow. His research focuses on the social history of early modern England and the application of computers to historical research and teaching. He is the author of The Church in Age of Danger as well as of various articles on historical and methodological topics. In the 1990s, he ran a series of externally-funded national computer-based initiatives, including the Computers in Teaching Initiative Centre for History, Archaeology and Art History and, as director, the TLTP History Software Consortium, a consortium of eighty UK institutions. He is currently working on three research projects: on lay-clerical relations in Elizabethan England, scolding and gender relations, and the digitisation and analysis of Welsh Wills. To take part in the live stream visit History SPOT on 28 May at 5.15pm and open up the pop out video, slide show, chat, and Twitter feed. Every now and then the Institute of Historical Research has a seminar that is not about research into History itself but about present day concerns and policies regarding how History is taught or expressed. Today’s podcast under the spotlight is a politically charged piece looking at the Secretary of Education’s plans for a revised History curriculum. History SPOT already contains several podcasts related to the subject of History teaching. Michael Gove himself presented his viewpoints about History education in the 2011 History in Education Conference held at the University of London. His presentation is available alongside various other papers about the state of History education in the UK. Then there is the Historians of Education in Scotland conference looking at the recent history of education in Scotland as well as modern day concerns. This podcast runs to 21 minutes and is available to listen on History SPOT. 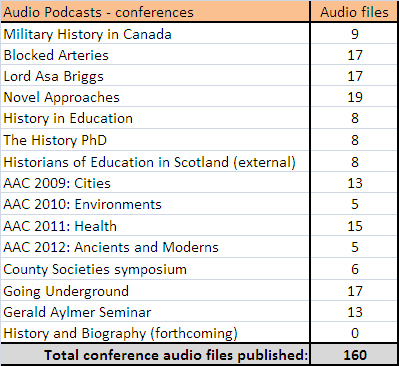 The History SPOT podcasts are derived largely from the IHR’s research seminar programme and its series of conferences. The first of these two tables show the regular contributors to History SPOT (i.e. the seminars who podcast all or most of their seminars) and those who podcast occasionally. 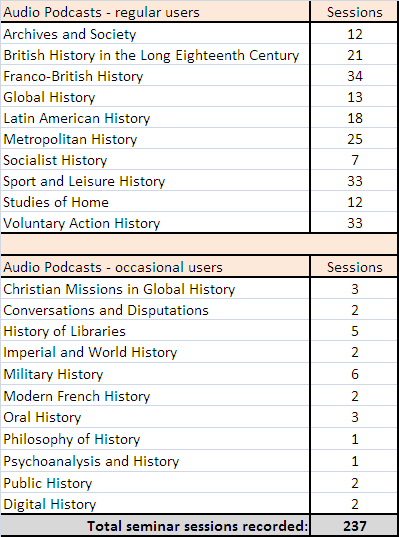 As of March 2013 the Franco-British History seminar (which is an external seminar series held in France) rates the highest number of sessions at 34 with our longest serving podcasting seminar, the Voluntary Action History seminar one session behind them. The second table shows the conferences that have been recorded and uploaded to History SPOT. It should be noted that the statistics here represent the number of podcasts rather than sessions. One more thing to note before I finish this post. The Digital History seminar is mentioned in the first table with only 2 podcasts. They are actually regulars, but they usually live stream rather than podcast. The same is true for the Gender and History in the Americas seminar. In reality the Digital History seminar have recorded 18 of their seminars whilst the newer Gender and the History in the Americas have recorded 4. These are generally available as both video and audio podcast from the website. Just a quick reminder that the Digital History seminar will be streaming live tonight at 5.15pm GMT. To take part in the live stream visit History SPOT at 5.15pm and open up the pop out video, slide show, chat, and twitter feed. This is a seminar about a prosopographical database, ‘The People of Medieval Scotland, 1093-1314’, which has been in production since 2007, and which has been freely available online since the summer of 2010. Since the relaunch of the database last year, we have had over 40,000 unique visitors from across the globe. Now nearing completion, the database contains records on over 20,000 individuals, drawn from over 8500 medieval, mostly Latin documents. The paper will examine some of the PoMS project’s technical innovations as well as the new directions we hope to take in the coming years. The seminar will take you behind the scenes of the public website to see how this database evolved from the factoid prosopography model created for the ‘Prosopography of Anglo-Saxon England’ (PASE) by John Bradley of the Centre for Computing in the Humanities, now Department of Digital Humanities, at Kings College London. PoMS has developed what might be called a ‘transactional model’ of factoid prosopography, due to the fact that it is comprised almost entirely of transactional documents like charters. Rather than simply recording events, the transactional model is explicitly interested in relations between individuals as recorded in the documents. We will examine the new structures PoMS incorporates to allow end users the ability to research the terms of the transaction, and thus the nature of the interaction between people, as well as multiple transactions happening at different times within the same document. We will look at the work of Michele Pasin, formerly of DDH, in developing new ways for users to both search and visualise these transactions. The seminar will finish with a consideration of the capabilities of the database for studying the social networks, and visualising the relationships between large numbers of people. Matthew Hammond is a Research Associate in the School of Humanities at the University of Glasgow and former Lecturer in Scottish History at the University of Edinburgh. Since 2007, he has been a team member of the AHRC-funded projects that created the ‘People of Medieval Scotland, 1093-1286’ database (www.poms.ac.uk) and is now working on a Leverhulme-funded project to expand the capabilities of that database, especially in the area of Social Network Analysis. To take part in the live stream visit History SPOT on 14 May at 5.15pm and open up the pop out video, slide show, chat, and twitter feed.